Being a hipster must be exhausting. You must ride the ever-changing line between geek and cool, unkempt and fashionable, organic and high-tech. What was hiply-ironic last year may no longer cut it with the goodwill-blazer-with-an-iPhone 4G-in-the-pocket crowd this year. Take beer for example. For a while now, the go-to brand for hipsters far and wide has been Pabst Blue Ribbon. It’s a beer that goes well with perfectly un-manicured facial hair and multiple layers of tight-fitting plaid. But that might soon be changing. Hipsters be warned! Sensing an opportunity to be a profitable punchline of sorts, Drinks Americas has relaunched the Rheingold brand of beer, hoping its retro coolness will make it the new go-to working-man’s beer for folks who want to show everyone they don’t care what others think. Even if they really, really do. Rheingold might prove irresistible to hipsters because of it’s irony-laden history. Before it disappeared from the market in 1976, Rheingold was headquartered in the Bushwick section of Brooklyn. Yes the Brooklyn that houses more hipsters per capita than any other overpriced urban center in America. The beer has retro-pop-culture cred as well, having been seen in the Godfather, The Soprano’s flashbacks, and as Don Draper’s lawnmower beer in AMC’s Mad Men. It was also the official beer of the ever-struggling Mets, the obviously ironic choice for hip New York City baseball fans. Add in the legendary Miss Rheingold pageant, where beer drinkers would choose which pretty face would represent the beer that year (I can already see the hipster-girl Halloween costumes), and it becomes almost irresistible. Although it’s been brewed on and off as a licensed property since the original Rheingold folded, this latest effort by Drinks Americas (who markets other meme-leveraging beverages like Trump Vodka, Dr. Dre Cognac and Kid Rock American Badass Beer) represents the first real national push for the reborn brand. The beer is being brewed at the Lion Brewery in Wilkes Barre, PA and is being distributed in (you guessed it) cans. So far you can find Rheingold in New York, New Jersey, Connecticut, Pennsylvania and Ohio. The rest of you are just going to have to hold your skinny jeans on and wait. Of course there are other alternative to Pabst Blue Ribbon for hipsters, so you might choose one of those, but irony is a dish best served fresh, and right now none is fresher than Rheingold. That’s cool. Sort of. Anyway, I have a Reingold can just like the one in the picture! Those old cans are cool, Scott. I remember watching Mad Men, where Don Draper opens one with a can opener, prying a triangle into the top of the can. Very oldskool! I’m assuming that’s the go-to beer for Pacific Northwest hipsters, where the flannel’s a little thicker and the patterns a little looser? Having just painted my house in the sweltering So Cal Sun, I can tell you with absolute certainty that the PBR’s prevented my death. 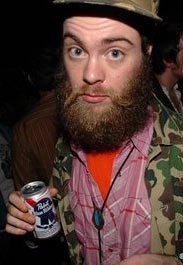 As much as I loathe the hipsters, I find PBR very drinkable. That said, I doubt this beer will ever make this far west, but who knows, I’d give it a whirl. Nothing wrong with drinking PBR, as long as you don’t have a Tri-Force tattoo and a Sufjan Stevens haircut. I was all ready to comment that Rheingolds will be my new beer for hiking and that I would be bidding on vintage rheingold ring tees on eBay all night. But then I read that kid rock has a beer. My world has changed. It’s certainly a different way to go – it’s cheap, tasty and give you a good buzz!! That’s how they market it. Nothing wrong with truth in advertising I guess. Quick… somebody tell this lazy good ‘ol boy just what the hell a hipster is. My mind is stuck on late 80’s and early 90’s terminology for categorizing people. And that…is the best explanation I’ve ever heard! I still like PBR and a case for 11.99 the price is right. It’ll never replace a Fouders KBS but I like it. Guess I’ve been a hipster all along and didn’t know it. Kinda like I was into the flannel grunge back look back in the 90’s all along too. PBR was first popular with the crowd you are referring to as “hipsters” because it was the only Vegan friendly beer. I find that the term hipster has been very abused by the beverage industry crowd in the 35-50 age bracket. Instead of mocking the people who are some of the strongest supporters of the growing craft beer, wine, and spirits segment they are ostracised. This really puzzles me. What is wrong with this movement if it promotes handmade and artisan products? It’s the whole “trying hard to look like your not trying” ethos. It’s working hard to be the coolest guy in the room. 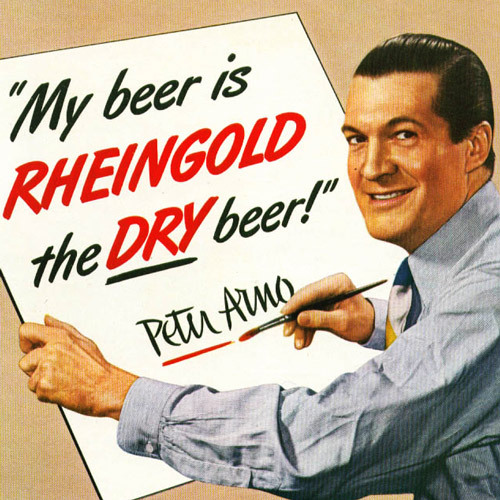 We all remember the standout beer brand of the mid 1900s, a beer called Rheingold which was first produced in the early years of 1883 and permeated society to become a top-selling beverage due to its fair pricing and solid taste. Rheingold’s appeal was so influential that during the 1950s, it accounted for a third of the New York’s beer market, revealing its widespread appreciation. Its pigeon mascot fits its New York origins and seemingly represents the soaring nature, specifically the taking off and popularity of this beer. Furthermore, the brand bolstered its recognition by holding annual Miss Rheingold Competitions, in order to find beautiful women to represent the brand and its image. 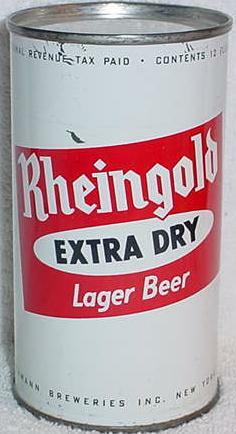 Apart from this endeavor, Rheingold sought to promote their brand by top advertising, hiring celebrities such as John Wayne and the Marx Brothers to represent the beer in popular television commercials. However, the most notable aspect about this beer is that it is making a comeback today, when it was acquired by the liquor company DrinksAmericas in 2005. I first came across this retro beer at a party a couple of weeks ago, and let me tell you that I loved its mellow flavor as well as the incredible amount of history which is associated with the brand. The fact that my dad used to drink this beer boggles my mind and shows just how pertinent the Rheingold brand is to various age groups, whether young or old. Everyone around me at the party enjoyed the beer too, as they kept on asking questions about this drink that they had never heard of before. If you haven’t heard of it or want to inquire about more information regarding this amazing beverage, hit up the beer’s website at RheingoldBrewingCompany.com, to be pleasantly introduced to New York’s Prime Beer! Take a look, then a taste, and you will agree with me that Rheingold is here to stay. yes yes, that i do.